I didn’t sleep well last night and that makes three nights in a row. 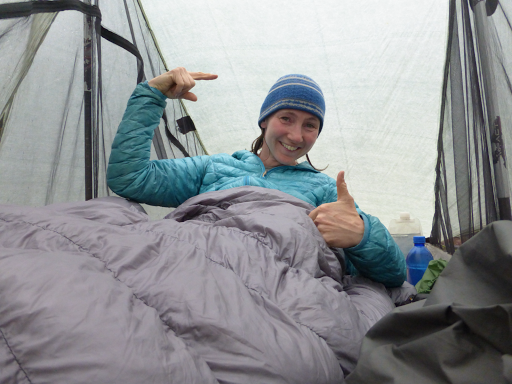 I had fallen asleep early for an hour when I first got in the tent from 7:30-8:30pm. It threw me off enough that I couldn’t get back to sleep until midnight. It was oddly silent outside and I usually need some kind of white noise. Then it started lightly raining and that woke me up again. Then it was midnight, raining, and I was hungry…and my food was hung far away. Yep, not much sleep. I woke up around 5am when Gian and Laura were getting packed up. They are camping with us again, but need to hitch out partway through the day and back to get a resupply since they will hit town on a weekend when the POs are closed. The road today and short day gave them the perfect opportunity to get that package. 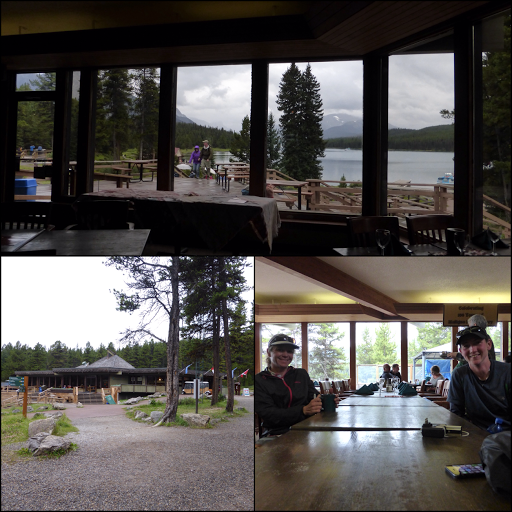 Our plan was to do 12mi/19km to the Maligne Lake area, spend the rest of the day lounging there, and then do the short 3mi/5km to camp after dinner with Gian and Laura if they return by then. We’ve been excited about this plan all leg and purposely made today a shorter day to get this break. The hiking this morning went by quickly. There was plenty more thick brush to work through the first hour or two, but thankfully, it was fairly dry and we didn’t have to contend with the boggy conditions we had braced for. 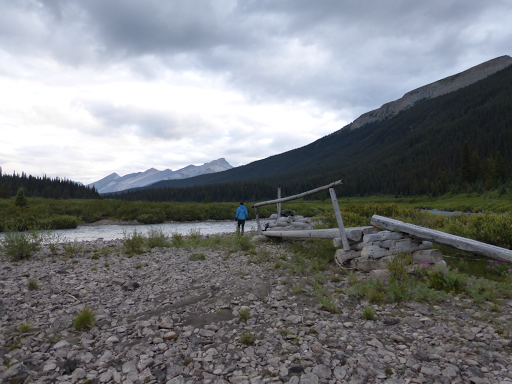 We had one ford of the Maligne River, which has a washed out bridge in tact on the shore just before the crossing. Our feet were actually dry enough to take our shoes off for the crossing and go in our sandals. It was just below 40F/4.4C and a chilly one, but we were still sooo glad to at least be somewhat dry. After that stretch along the river, we went into the forest with an average amount of brush that was also thankfully dry for the most part. I think I’ve worn my rain jacket and rain pants more on the last two legs than not. It’s just been a given that I’m wearing them each morning over my hiking pants and sometimes they come off by lunch, but the last two day have been all day. Both our feet are feeling the effects of days of cold wet feet and we were happy to not be soaked first thing this morning. They eventually got wet from the brush, but we’ll take it! We made great time and E stopped at a campsite table for breakfast. 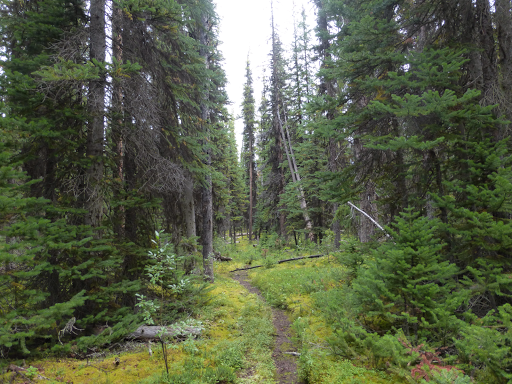 There were a lot of mosquitoes, so I hiked on to our destination at the Maligne Lake area. More forested trail that improved as I got closer to civilization. 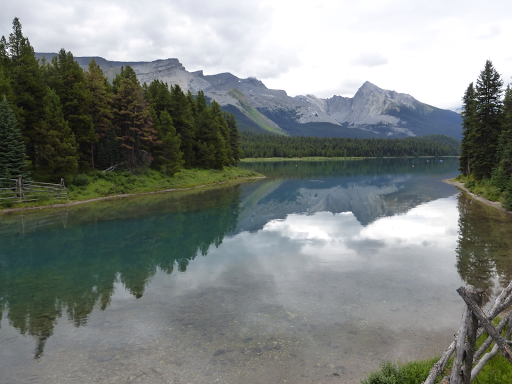 At the trailhead, it’s just a short side walk down a road to the tourist destination of Maligne Lake. It is a huge lake and I imagine the boat tour would be nice to see the whole thing and the mountain ranges surrounding it. It was pretty quiet and I saw Gian and Laura attempting to hitch the 30mins to Jaspet to get their resupply package. We talked a bit and hopefully they got the hitch soon after. Somehow, all our info says there is a lodge that holds 100 people, but there isn’t. It seems to be something in Jasper. Out here is a day lodge with no overnight accommodations and pretty pricey food in a cafeteria type of presentation. E arrived a bit after me and we each got something to eat, which was nice since this has been a long leg. There was sadly no wifi, but we were able to find plugs to charge everything and just RELAX in a DRY place. 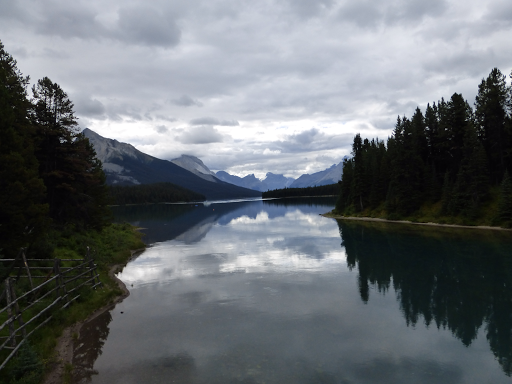 We stayed for 7 hours and looked out the windows overlooking a cold rainy day over Maligne Lake. We were sooo happy to be indoors and dry. I couldn’t do much since I didn’t have wifi, but was able to write some offline things to be sent once I do get service. We both would have loved a nap. If it weren’t raining, it would have been a perfect spot to nap outside. I also got to watch more of OITNB and am just two episodes from the end of the season. Sadly, the last two episodes were loaded incorrectly and I’ll hopefully get to watch them when I take my zero in Jasper. I did move over to finishing the first season of Empire which is quite entertaining and I get why it was the big buzz of last season. I’m happy I am fully charged to watch that tonight and tomorrow night. Gian and Lara returned from Jasper around 5pm with the most wonderful thing…my beanie!!! I mentioned two days ago that I’d dropped it on trail in the morning shortly after hiking with fellow GDTer, Ted. I was able to text Ted through my Delorme InReach and he did have the hat, but had an accident and had to go into Jasper early. He left it at a B&B and Gian and Laura picked it up for me while they were in town. I am so happy to be wearing it tonight and haven’t slept well the two nights I’ve been without it. I’ve yet to be able to load the email Ted said he sent me about his accident that has taken him off trail. All I know now is that he ended up getting something like 18 stitches in his leg, but he must have hit his head too because he doesn’t know how it happened. My understanding is that he was able to get airlifted out after communicating the situation with his Delorme InReach. 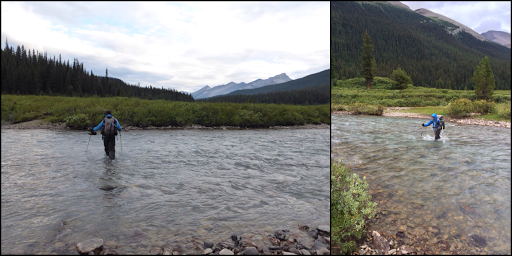 That story is two sources removed, so I’ll know the full story when I get to Jasper. All I can say is that he’s the second person I’ve personally known to be airlifted thanks to the Delorme InReach and I’m sure glad I have one! We left the day lodge at 6pm and it was still lightly drizzling at times. 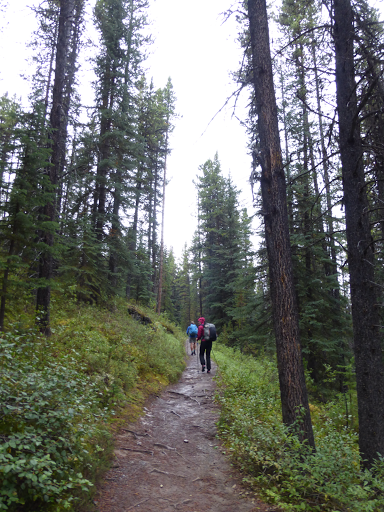 We headed on to the Skyline Trail, one of the most scenic and popular backpacking trails in the Canadian Rockies. The GDT overlaps the full Skyline and we will do the whole thing tomorrow. As we hiked in, it was great to have a clear wide trail to cruise on. 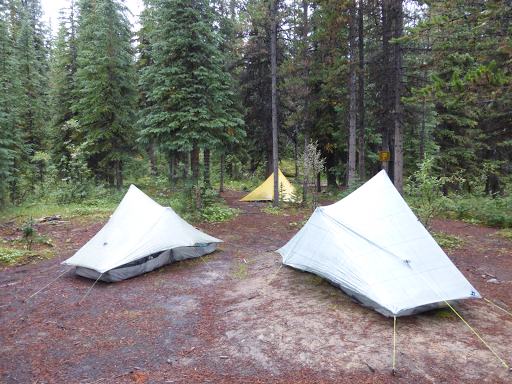 There are many campsites along the way that book up quickly when they become available 3 months ahead of time. 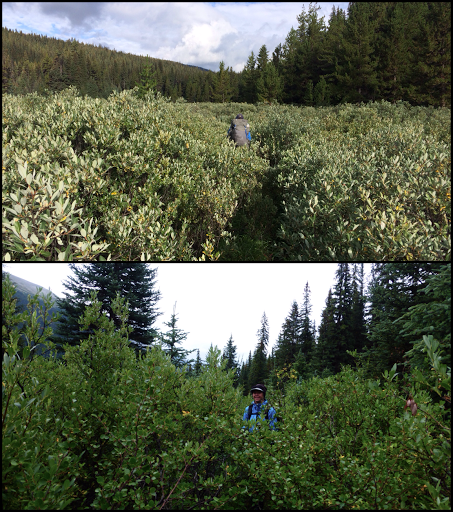 Our site tonight, Evelyn Creek, is the first one just 3mi/5km into the trail. There are four sites available and E and I have two of them. So that Gian and Laura could get their resupply and spend more time with us, we agreed to share a site and give them the second one. Their next site is a half day away from here, so they will sleep in and we will see them in Jasper or the following resupply stop Mt Robson. Oddly, no one else is here tonight. Our guess is that they are avoiding the rainy night of camping, and starting tomorrow when the weather is predicted to clear up. Perfect timing for us to do the Skyline! Our luck with good weather where it matters continues hopefully! Speaking of good timing, it really started to rain once we all pitched our tents. E and I had eaten our trail dinners at the day lodge and are now warm and dry in the rain pelted tents. Such a great feeling! 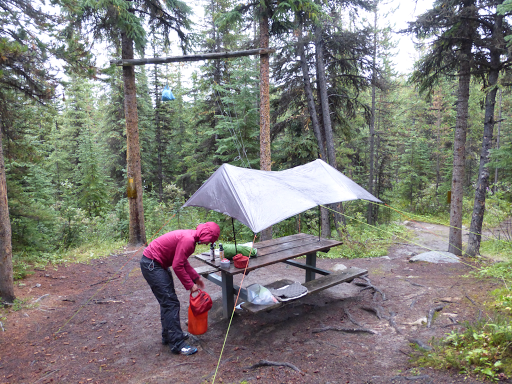 Gian and Laura have a tarp that is common out here that many use on the picnic tables so they can eat under protection. Behind it is the bear hang cables we’ve been using at every site.